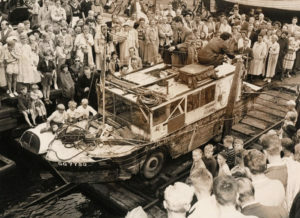 Most of the early developments in automotive amphibious technology centered around military use, with the 1944 WWII Schwimmenwagen (shown above) as a perfect example of an amphibious car developed for military use. 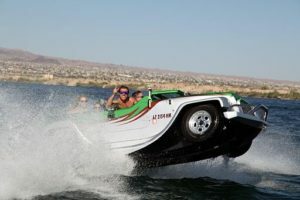 As amphibious automotive technology advanced into the 1960’s, these car-boat crossovers began to transform to a more car-like shape, distancing themselves from the boatlike appearance of the early versions. The Amphicar (shown above) was a West German vehicle, in production from 1961 through 1965, though it continued to be marketed in the US through 1967. 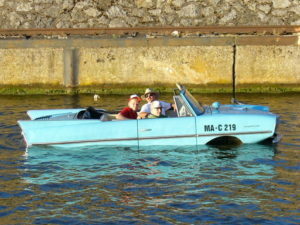 The Amphicar was produced in four colors, Lagoon Blue, Fjord Green, Beach White, and Regatta Red – and only 3,878 were ever produced, with US President Lyndon B. Johnson owning a Lagoon Blue model – which he reportedly used to tease guests and make them think the car was out of control as he drove into the lake. 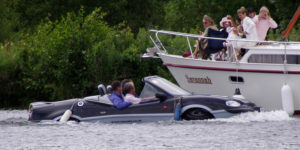 A couple of more recent cars of this genre are the Gibbs Aquada (shown above – and which, by the way, is the type of car Richard Branson used to set a record crossing the English channel in an amphibious vehicle) which has a shape slightly reminiscent of a 1980’s Corvette and is known for high-speed planing on water – and the Water Car (shown below), which is built in California. 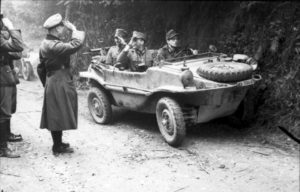 Amphibious vehicles have a rich history in both the military world and in the general population, and I’m thinking it should be fun to see where this fun-in-the-sun technology takes us in the years to come. If you are looking to buy or sell a classic car, such as an Amphicar or any other classic, feel free to take advantage of the free listings on the Classifieds page.